Season the chicken with paprika, salt and pepper to taste. Turn on the Instant Pot ON and select "sauté". Heat 2 tablespoons of oil. Add the chicken and cook for 5 - 8 minutes or until chicken is lightly browned and no longer pink. Remove chicken from the Instant Pot and reserve. Add the remaining 2 tablespoons of oil to the Instant Pot. Sauté onion, peppers, garlic and green onion for 3-5 minutes, or until onion is translucent. Add the rice and toast for 1 minute, stirring constantly. Add chicken broth, seasoning or saffron, frozen vegetables, and cooked chicken. Mix to combine. Taste and add more salt and pepper if necessary. Bring to boil. Press "cancel". Secure the lid to the Instant Pot. Close pressure release valve. Select "manual", or "pressure cook", and adjust cooking time to 10 minutes. 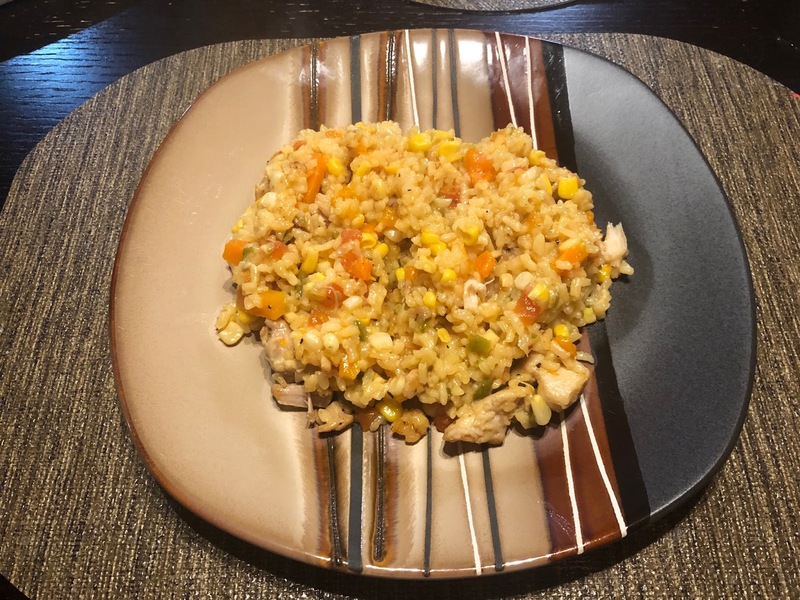 Fluff arroz con pollo with a fork and serve hot.